Compact and ready to rage, the 4WD 1/24-scale Roost™ Desert Buggy doesn't mess around whenever its wheels are spinning. Equipped with a rugged 4WD drivetrain and potent micro motor, the Roost simply won't quit until you've reached maximum calamity. The Roost handles just like a real desert buggy and even looks the part thanks to a multi-panel screened body and roll cage. Best of all, an included USB charger gives you the convenience of being able to charge the included 220mAH Ni-MH driving battery nearly anywhere you can find a USB port. Plus, a bottom loading battery compartment means you'll never need to remove the body and spoiler to access the battery after you've reached empty. 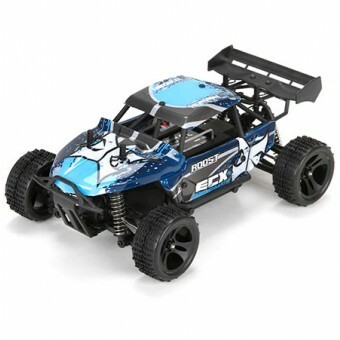 Whether you want to sling sand or pulverize pavement, the 4WD 1/24-Scale ECX® Roost comes ready to handle nearly any challenge.